The moon casts a cool, blue light into the scene, which is contrasted with the yellow/orange glow coming from the pillar of cloud/fire, which is behind the Egyptians. 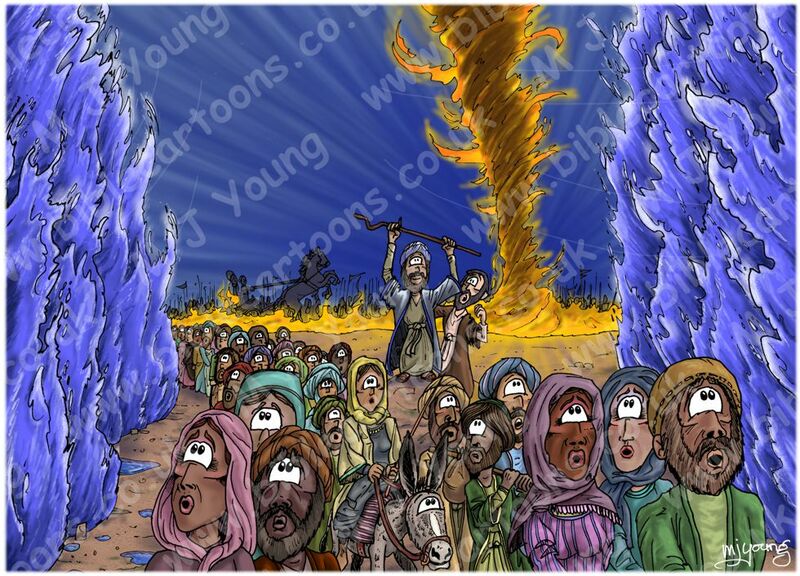 Moses (holding staff on top of rock), various Hebrew people, walking past him, towards the viewer. This scene shows the Egyptian army & their Pharaoh (king) in the background, kept at bay by the column of smoke & fire. 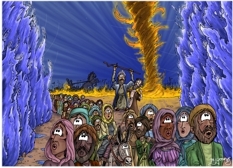 The Hebrew people are beginning to pass through the parted Red Sea, walking towards the Promised land, which is behind the viewer. This is the third version of this scene, designed for an American sports ministry organisation.